rocky's bru: So why is the mighty Ku Nan so quiet over Datuk Keramat's "Twin Tower" controversy? So why is the mighty Ku Nan so quiet over Datuk Keramat's "Twin Tower" controversy? Ku Nan: Can put a stop to the Datuk Keramat issue? 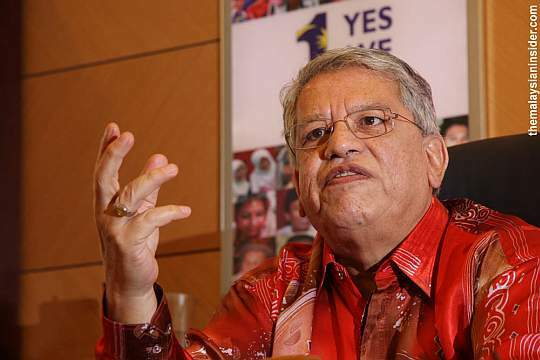 In Datuk Keramat vs Datuk Bandar KL: Why DJ is taking a huge risk by defending the residents, I wrote of how City Hall's insistence on building luxury homes on a site meant for the Malay poor could cost BN/Umno precious votes in the next general election. What happened to Lembah Pantai in 2008 and again in 2013 could happen to Titiwangsa. I was hoping that some big wigs in Umno would jump onto the bandwagon and help Datuk Johari Abdul Ghani, the MP for Titiwangsa, in his fight against the Datuk Bandar of KL and the invisible hands that are controlling the strings from behind the Mayor's office. I was hoping, especially, for Umno sec gen Tengku Adnan Mansor, who is also the Federal Territories Minister, to throw his weight on this one. His silence is so deafening. I must say. You see Rocky, that's the difference between being a MINISTER and only an MP. Sanggup jual maruah utk dapat syorga dunia. Why no transparency in land acquisition matters? Open tenders no longer applicable, izzit? Because it's the right thing to do.Something our leaders and Ministers have to learn. Cari Makan la Bro! It is our Malaysian way. Mungkin Ku Nan dan kroni ada kepentingan dalam projek ni...Sedih rasanya ada pemimpin macam ni kepentingan diri ,poket dan kroni yang diperjuangkan bukannya nasib rakyat...patut sekarang makin ramai membenci UMNO dan pimpinan Najib sebab kes-kes sebegini..tungulah saat kejatuhan mereka..